Boys in our Books welcomes Aleksandr Voinov to the blog to celebrate the release of his new book “Nightingale”! I’ve spent a lot of time thinking about genre – you know, things that are kind of important when you want to make sure you’re not mis-selling your books to people. And I keep coming back to the whole “what is a romance exactly?” question. Recently, in HeteroRomanceLand, when discussing a “controversial” romance, one of the most important things about a hetero romance is the issue of consent – the characters in a romance should have and exercise consent. (This seems a more or less recent development after some of the sometimes very popular “rapey” romances of the 1980s and earlier – that said, I’m not a romance historian, this is all stuff I observed from discussions and I’m happy to be corrected.) This means that, for example, the love story between a slave and a master, when actual ownership is involved, cannot be a romance because the slave is unable to exercise consent. And consent is a huge issue, of course. It’s within living memory in Europe that young women were “stolen as brides”, which means they were kidnapped, raped, and then forced by society/their families, to marry their rapists. Such a “kidnapped and raped bride” story couldn’t be a romance, and I agree. So, yeah, I agree that consent is the one characteristic that a romance can’t do without. Now, I’m an author who’s very interested in consent issues (this surprises exactly no one). I also have a weakness for the main character falling in love with the wrong person and then making a better choice later in the book – as the character grows and becomes more experienced in matters of the heart, he might revise his past mistakes or realise the current partner has traits or characteristics that he might have overlooked at first but simply cannot abide any longer. For me, it shows how the character matures and makes better, more informed decisions. Maybe on some level, I’m working through some pretty poor romantic decisions I made in my twenties, who knows where that stuff’s coming from? But this is often not how romances are structured. The “rule” in a “category romance” is that the love interest pretty much appears on page 1 and the whole book is about that central relationship. And I can see the attraction – people like what they like and that rule exists for that reason. A romance reader loves nothing more than having both characters on the page, striking sparks off each other. It’s just that I sometimes write books that don’t quite fit into those rules, so I’d call Nightingale a gay historical with a strong love plot. Arguably, Yves makes some pretty poor decisions when it comes to “matters of the heart”, considering he’s cavorting with the enemy, and arguably there’s a lot of pressure for him to hook up with one of them – arguably, considering how much power imbalance is at play and how dangerous the situation is, he’s not in the best position to give (or withdraw) consent. But, is it a love story? Do both characters change because of love? Is love one of their main motivations to do the things they do? Yep, yep and yep again. I’ll never get tired of writing about how love changes us, motivates us and how we fall – sometimes despite ourselves. 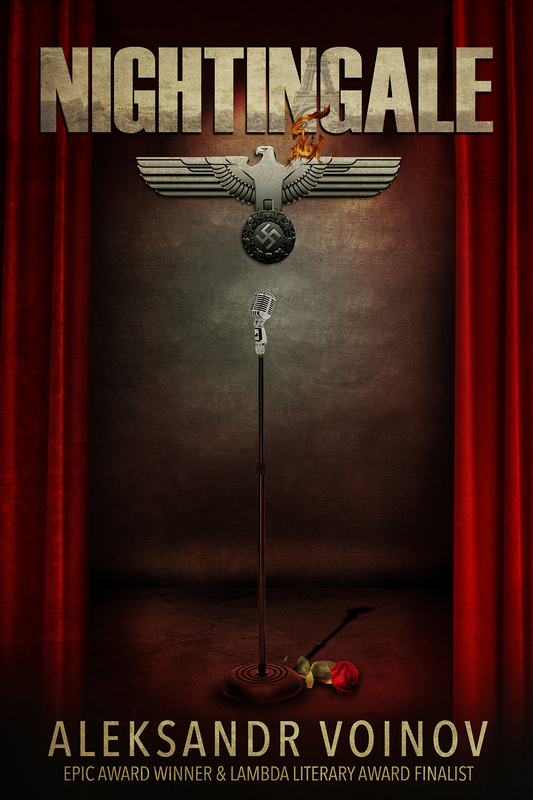 In Nazi-occupied Paris, most Frenchmen tread warily, but gay nightclub singer Yves Lacroix puts himself in the spotlight with every performance. As a veteran of France’s doomed defense, a survivor of a prison camp, and a “degenerate,” he knows he’s a target. His comic stage persona disguises a shamed, angry heart and gut-wrenching fear for a sister embedded in the Resistance. Yet Yves ascends the hierarchy of Parisian nightlife to become a star, attracting the attention—and the protection—of the Nazi Oberst Heinrich von Starck. To complicate matters further, young foot soldier Falk Harfner’s naïve adoration of Yves threatens everything he’s worked for. So does Aryan ideologue von Grimmstein, rival to von Starck, who sees something “a bit like a Jew” in Yves. When an ill-chosen quip can mean torture at the hands of the Gestapo, being the acclaimed Nightingale of Paris might cost Yves his music and his life. This entry was posted on December 3, 2015 by BioB in Guest Post, Historical and tagged aleksandr voinov.